Had another fab breakfast at the Savoy, pastrami wrapped gherkins, turkey sausages, mashed potato (? 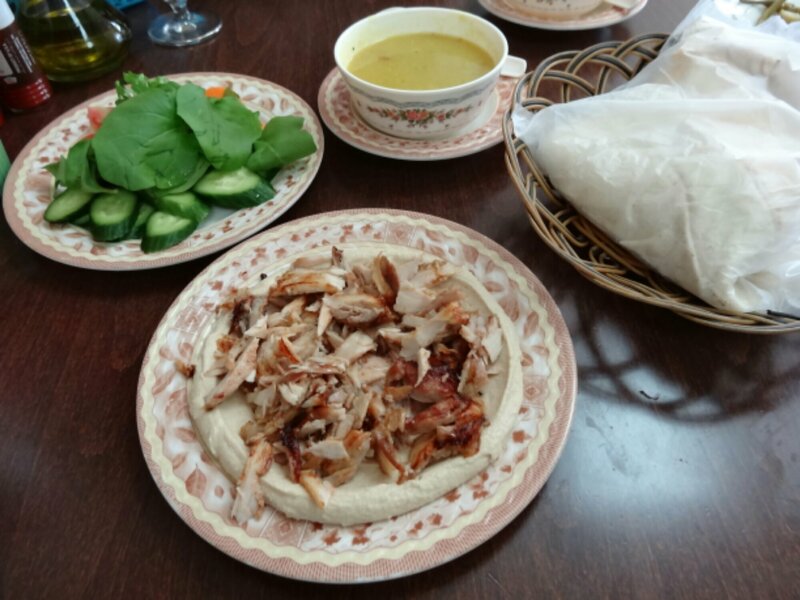 ), hummus, labneh, fresh dates, flat bread and green tea. We then packed up and went down the street to our new apartment, Golden Sands. 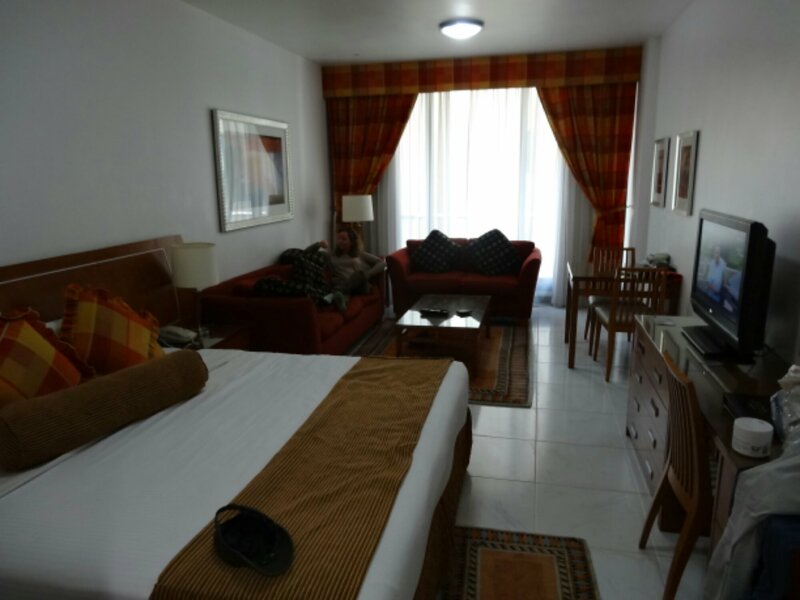 It isn’t as new as The Savoy but it will do for the night, plus Grosse Pointe Blank was showing on Fox Movies when we switched on the TV, so that was a bonus. 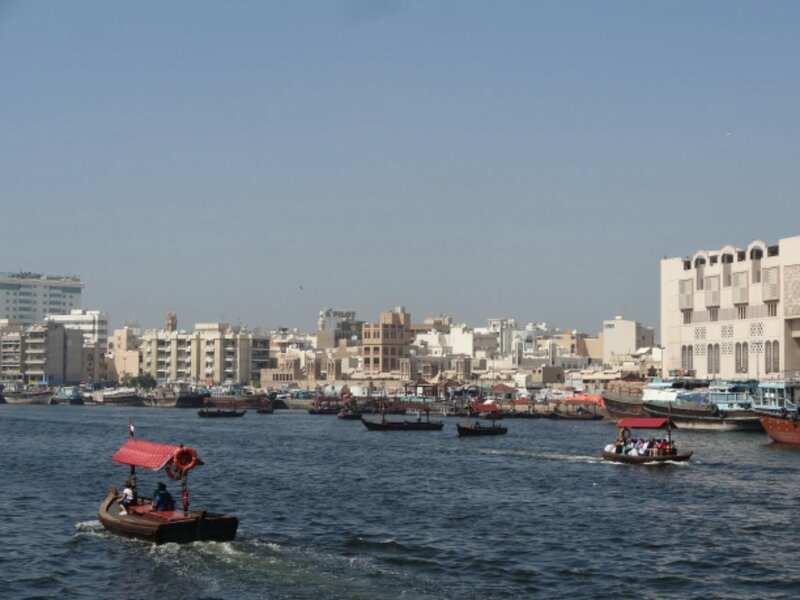 We were looking forward to a bit of walking today, and set off to explore the souks of Dubai. We should have realised that this would have been made into a plastic tourist attraction, it was all rebuilt and nicely clean and well planned, just like Dubai. It was awful, all the traders practically man handling you to try on a blooming pashmina, I mean, do I look like I buy pashminas? 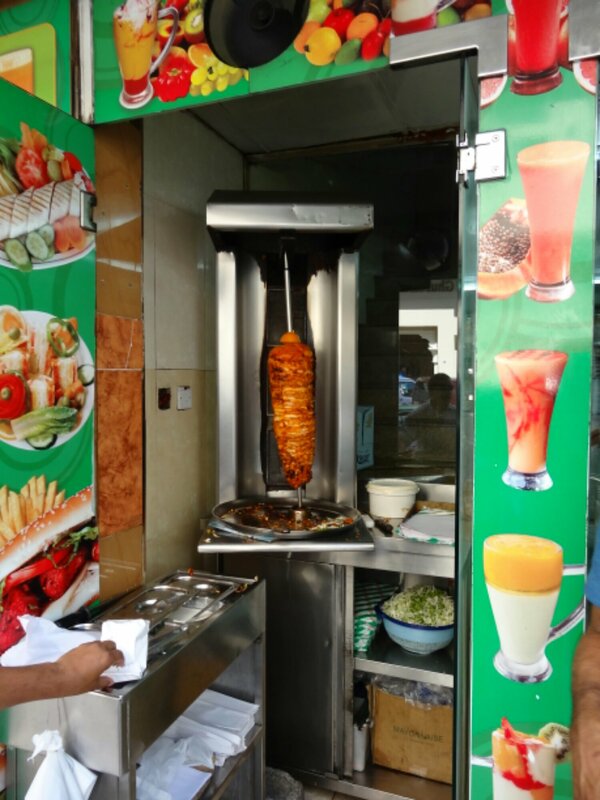 We got off the tourist trail of souks and found a real Indian cafe selling chicken shwarma, tea, fruit juices and falafel, we had a bit of each for the princely sum of £4. It was fab! Wandering back to the hotel, we then had our second lunch of chicken schwarma and hummus meal and falafel wrap, it had fresh spinach in it which was something we haven’t had for a long, long time!! Then back to our apartment to find our house keys, last seen in Guy’s green flash trainers which have spent the whole trip at the bottom of his rucksac, and post our last blogs before returning home. It goes without saying that we have had a great time. Great places, people, food and a few beers. We hope you have enjoyed our blog as much as we have and we can’t wait to see you soon. Slept well in the big posh bed but woke up at 5am. 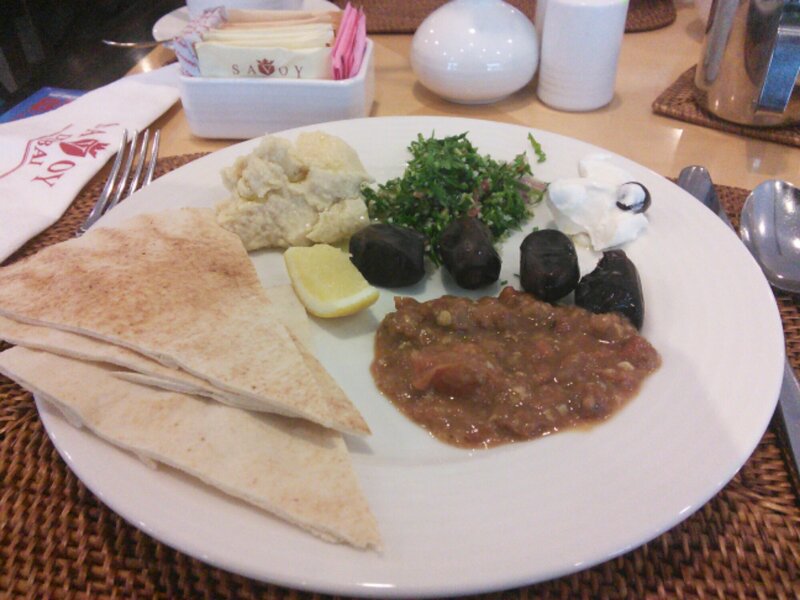 Our buffet breakfast included humous, cheese, olives, lebneh, fruit and curry, best brekkie since India. We discussed the day and decided to do a big bus tour and there were three on offer, old town, beach and night. As we are only here for two days and are used to 10 hour bus journeys we bought a ticket for all three and set off in the hazy mild Dubai morning. On the top of the bus the mildness became cold but eventually the sun melted the haze and by the end of the day the bald patch was burnt, and Al had racoon eyes. First up was old town which took us around the creek and souks. The onboard commentary peppered the history spiel with sales pitches ie “here’s the gold souk. Gold makes a great present” or “dates are important to arab culture and make a great present” which seemed odd. After 2 hours we switched to the beach tour which included all the big shiny hotels and the man made islands. The onboard commentary began to pepper us with stats on how many cafes, bars, rooms and celebratory chef restaurants were located in each hotel. 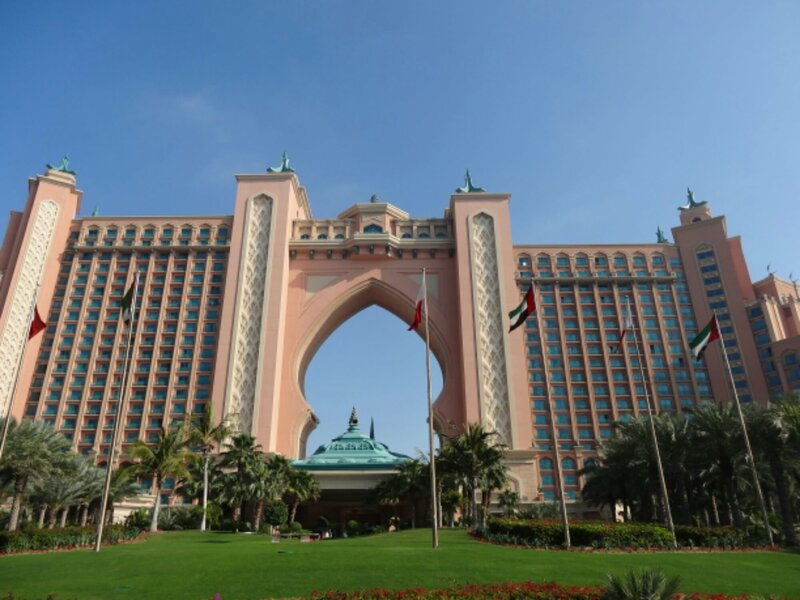 The main hotel on the man made island is themed after Atlantis, a myth of a civilisation disappearing into the sea. Isn’t that tempting fate? They explained that the storm defences could withstand a 4m wave and at low tide the sea is 4m down. I guess they don’t expect a storm wave at high tide? We also toured shopping malls and learnt that the Dubai mall has 12 million sq foot and is the largest mall in the world. 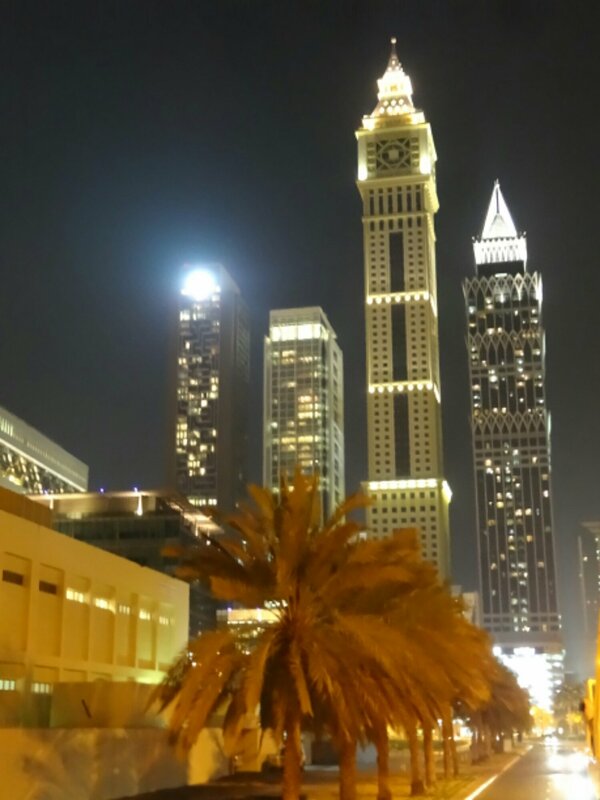 The Mercato mall is the first Italian renaissance styled mall in the Arab emirates. The Dubai ski is the first all year snow ski slopes in the middle east. Eventually the commentary sounded like an insecure youth trying to impress and I think I would have preferred the sites without the sales pitch / showing off. Anyway after an hour break where we had a pot noodle and booked a room for tomorrow we got on the night tour and despite more blah blah, the sites were amazing. The already beautiful skyscrapers looked even better with their lighting on. I took many photos. 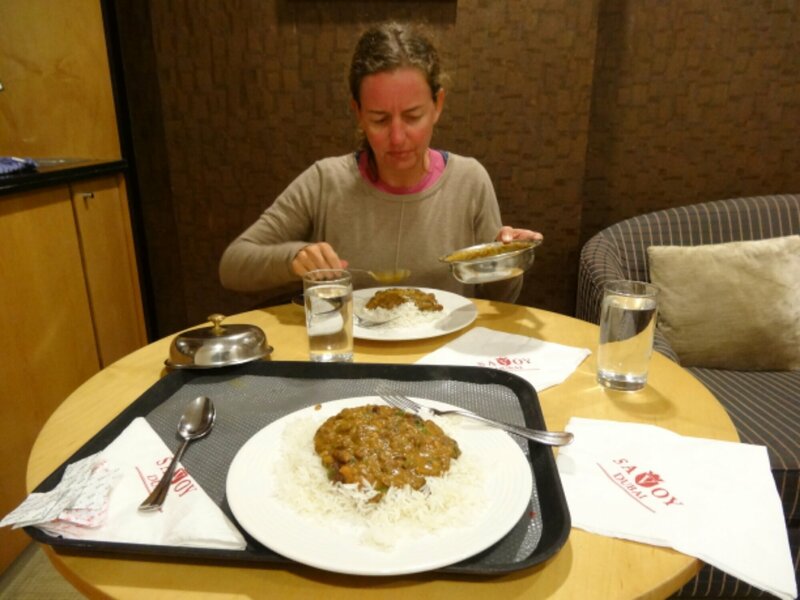 When we got home we ordered Dahl makhani in the room and it tasted sweeter as agoda had refunded our booking money. So, bags packed we hailed a taxi and spent the next hour in the taxi trying to get to the nearest skytrain station for the airport. There were quite a few road blockages from the protests and our taxi man seemed to be surprised whenever he saw one! Still that cab cost less than £2. Took the skytrain and did the usual check in malarkey, it was 12.30 by now and we had skipped breakfast so headed straight to the dirty Burger King and Pizza 123 stands and got a fill of western carbs to keep us going. A quick perusal of the duty free and guy had a very nice bottle of Laphroaig and I had perfume…..was weird wearing that again, can’t believe I might have to wear makeup again soon as well! Flight was fine, apart from the chunky German I sat next to who kept encroaching on MY side of the chair…..
We watched the Lone Ranger – dire, Hangover Part 3 – truly dreadful, World War Z – dire and The Counsellor – OK.
Got a 20min taxi from Dubai airport that cost us £10 and we nearly passed out in fright. We sauntered into our hotel, The Savoy * and were informed that we were a month early for our booking! We had booked it when were ill in Penang and neither of us had realised it was for march dates. 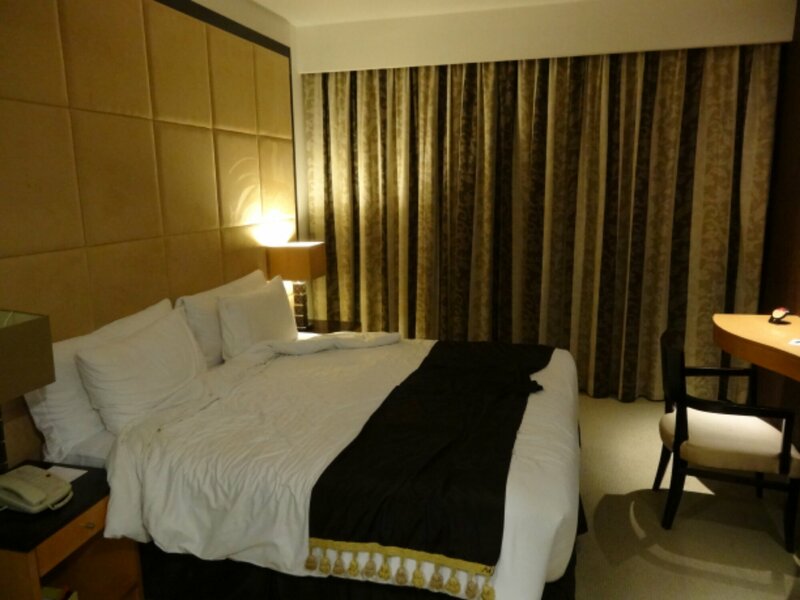 They said they had a room, however as there was some exhibition on, our third night would be over twice the usual rate..…so we paid for 2 nights and emailed to try and get our money back from Agoda who had already taken the payment from us. 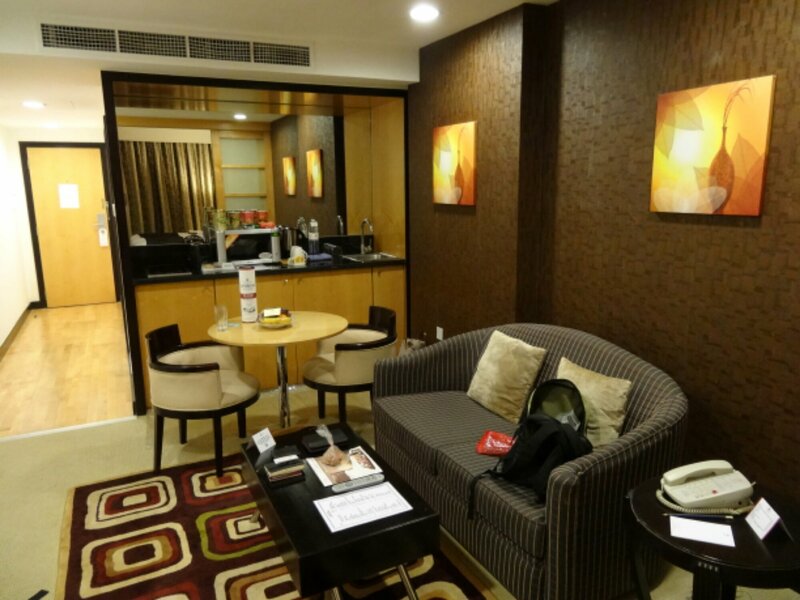 The suite was amazing, huge, with its own dinky kitchenette, we were very happy! We had a Thai pot noodle and a small Laphroaig to celebrate! * The Savoy Hotel Apartments. 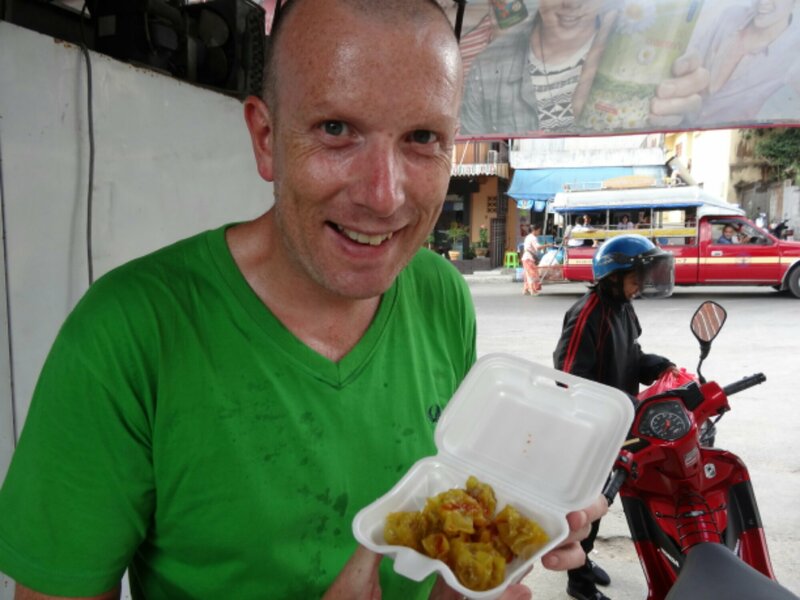 Had fruit and Bangkok street food for breakfast for the last time ……..
Wandered round the streets of Banglampu buying presents and cheap flip flops! 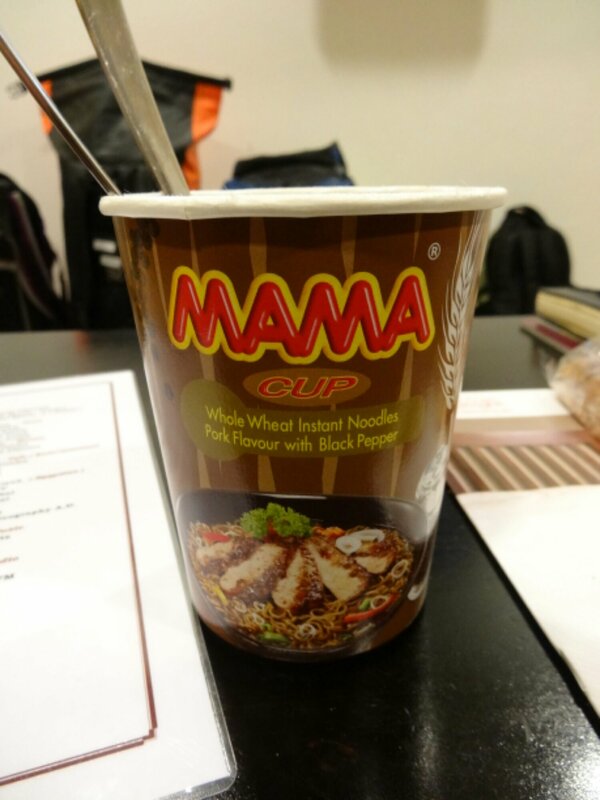 Then we did the supermarket run, loads of Thai pot noodles for Dubai. 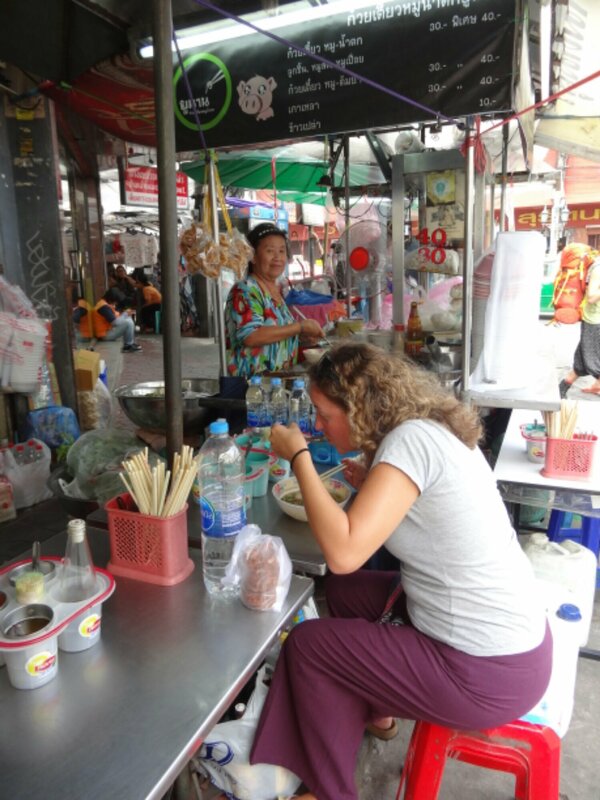 We had a last noodle soup from our noodle soup grandma, met some Aussies who said it was nicer then the grasshopper soup they ate in Chang Mai, a compliment if ever I heard one! We then had a tour of the area, picking up WiFi, and maybe a couple of beers! I had a massage and a pedicure. 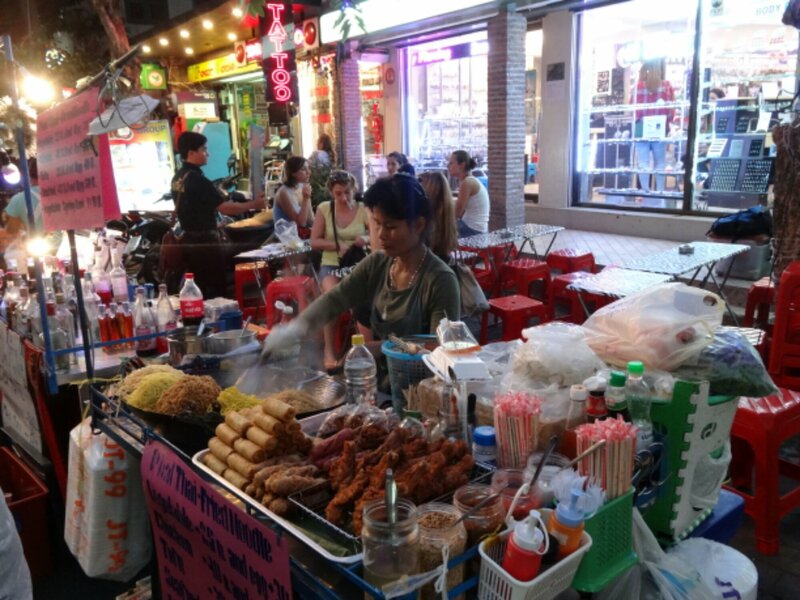 Our last Thai street meal was fab… Guy had fried shrimp chilli paste, looks hot but it was tasty and surprisingly light. I had green curry which was lush too. A final Chang in our favourite acoustic bar and appropriately it began to rain. The first since before xmas, like the gods are preparing us for home. We are having a Chang in a restaurant that we came to 15 years ago where we have funny memories. Last time we were here, Alison, the experienced traveller, had told me, the kid from Wolverhampton, that in Asia people don’t use toilet roll. They simply washed their derrière with soap. Back then all the toilets were squats, like in french campsites, and, as now, had accompanying water hoses. 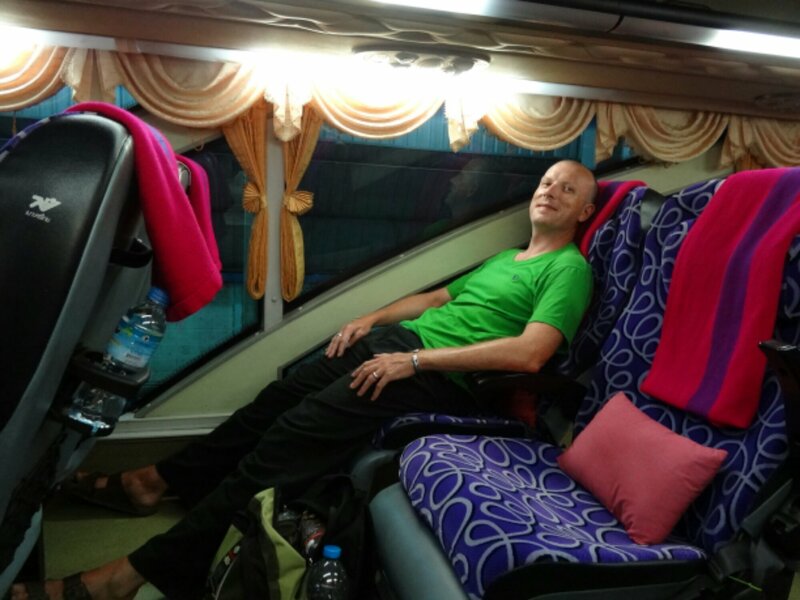 After two weeks in Vietnam I felt like a bona-fide traveller and pleased with myself that I could adapt and fit into other cultures. 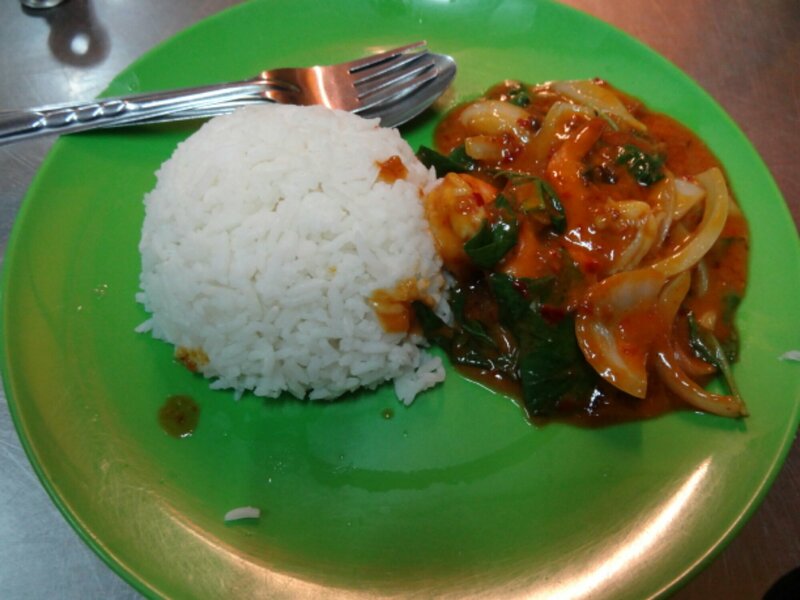 Back in Bangkok we entered the restaurant that we are now sat in and feeling the call of nature I got the soap dish out of the bag and headed into the facilities. The toilet was very small and chaos ensued. After using the facilities I managed to completely soak myself and my suitably coloured beige shorts using the particularly high pressured hose. I left looking like I’d poured 5 litres of water down myself. My caring wife and a few other restaurant patrons were in hysterics. This was the moment she told me toilet roll was not just for blowing your nose in Asia. 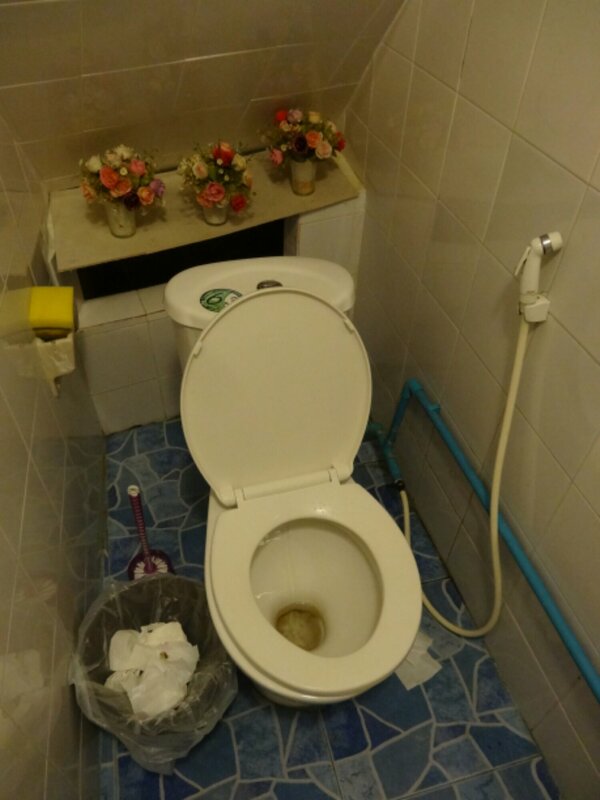 Here is the loo now. The squat has had an upgrade. She also told me all rain in Asia is only vertical. I’ve never trusted her since. We arrived in Bangkok at 5am and headed to new Siam guesthouse. They had a room but it wasn’t ready until 7am so we headed out to Khao San to oggle at the folk still enjoying last night or “casualties” as we know them. 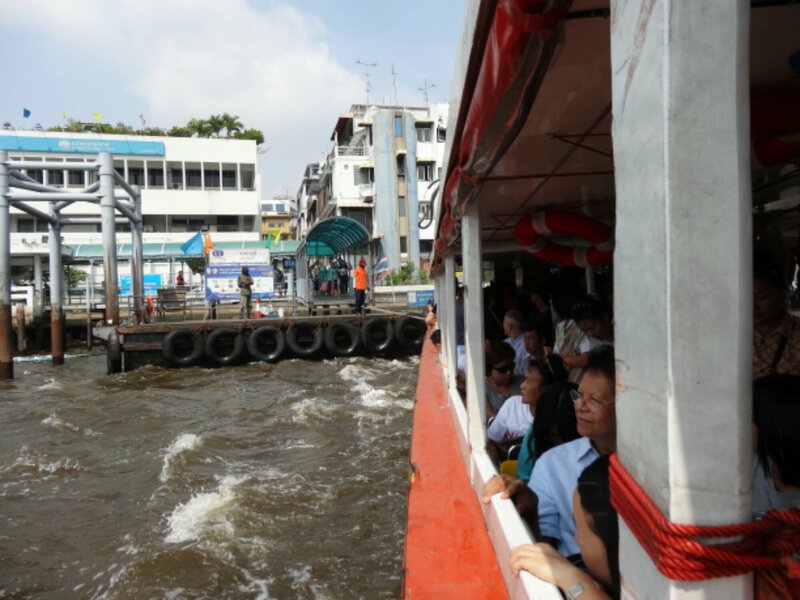 A shower then the river taxi and sky train to the MBK centre for a last shop. While we waited for it to open we looked at the protesters camped underneath. 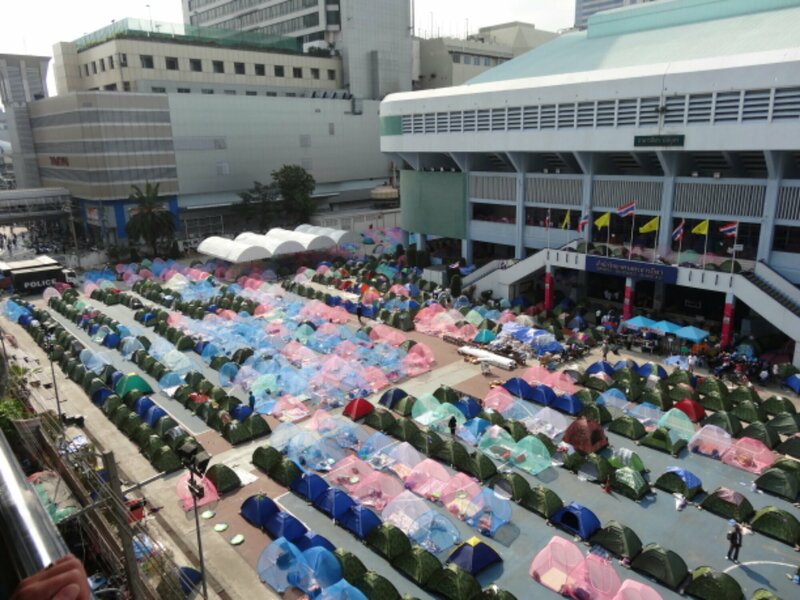 Hundreds of yellow shirts trying to overthrow the current government with a “Shutdown Bangkok Restart Thailand” campaign. Ordinary people wanting a better future. Breakfast of spicy larb and crispy pork and then a haggle for presents. As we were early we got Best price! Timmy Hillfonger, Ralp Loren and Rolax were bought. Al was flaking so she went back for a siesta and I continued to window shop looking at tecky stuff. Tired I decided to head home and caught the river taxi. We had to stop to pick up passengers from another knackered boat and then we got stuck at a peer as the trainee rope man couldn’t un-moor the boat. After a lot of shouting a bloke with a machete appeared and hacked us free. Notice the rope-mans balaclava which a lot of outdoor working Thais wear despite the heat and humidity. After a siesta we headed for our last big night out. We crawled our favourite route and watched the craziness and reminisced about our trip. Eventually in the acoustic music bar we succumbed to a Sang Som set comprising of a half bottle of Sang Som, a Thai rum-like spirit, bucket of ice and soda water. The battered sausage and fried chicken at the stall opposite provided the necessary grease and we capped the evening with the obligatory magnum. Last day beach side and we were very sad to be leaving. We woke up to the usual sound of the waves on the shoreline, birds in the coconut trees and the dog with 4 legs, one limp and useless, chasing any motorbike that came down the beach – we are convinced he lost the use of his paw through this pastime of his. We did our last walk up and down the beach. Even managed a bit of yoga on the beach as well! We are soooo out of shape. We packed our bags and had breakfast at our restaurant, the pancakes were delicious, we spent the morning chatting to our new brummie mates. Unbelievably, new people took over our hut before we had even left the grounds, so insensitive to our feelings!!! 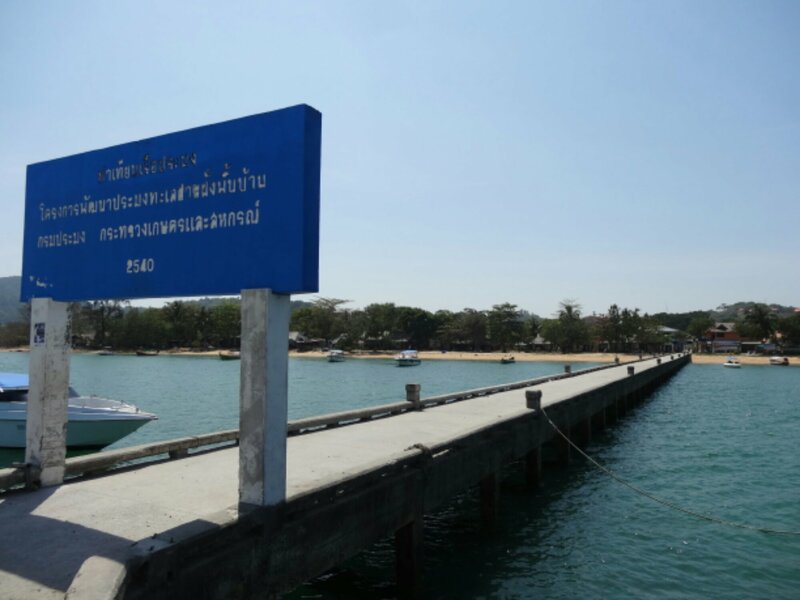 A lot of hugs and air kisses later from our mates, and staff, at coconut beach and we sped off on motorbikes, minus helmets of course, to catch our speedboat to the mainland and back to reality. 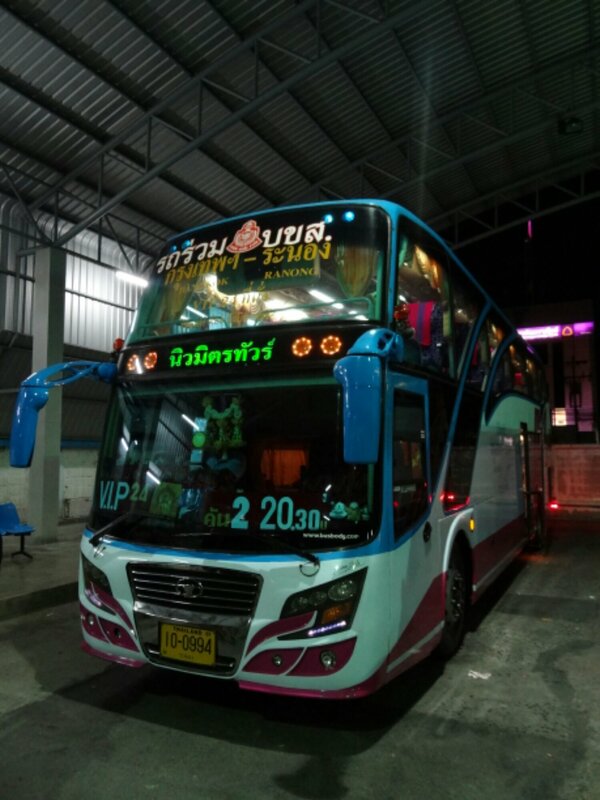 We had 3.5hrs transfer time in Ranong before our overnight bus left. 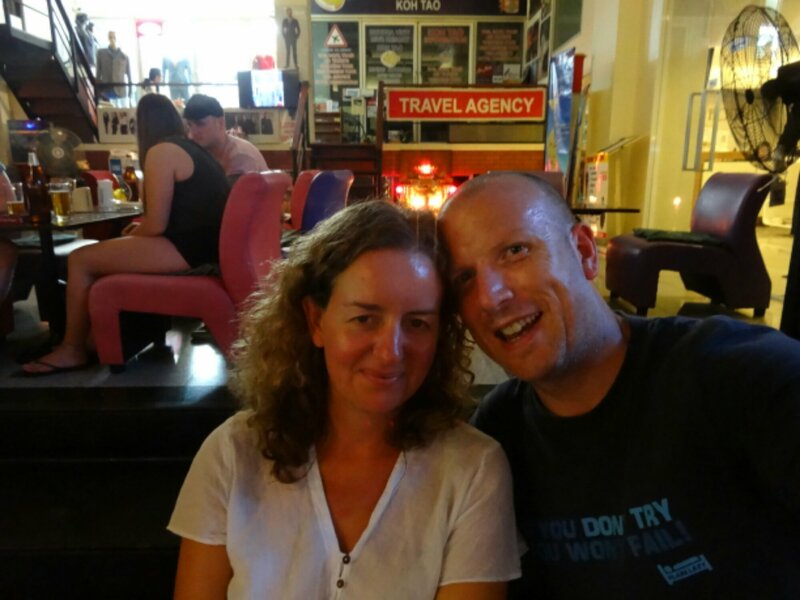 This was spent sweating and eating street food – a fried sweet corn sandwich, pork and shrimp dim sum, chicken satay and pork kebab later we were full, although a couple of beers managed to slip in there as well. We caught a songthew (open backed van) to the bus station and our jaws dropped when we saw the bus. We had gone VIP but this was really luxurious, the seats reclined nearly horizontally and we got a free cake, water, vakpak of some weird milk, blanket and a grumpy ‘waitress’! Oh, and a load of chatty Germans…..as usual. Guy slept most the night, the bloke next to me dropped off about midnight and snored his was to Bangkok and I had a couple of hours kip in between all this excitement.